Hello folks! I have a bit of catching up to do. I was not able to post images on my last blog entry, so I will add them here. 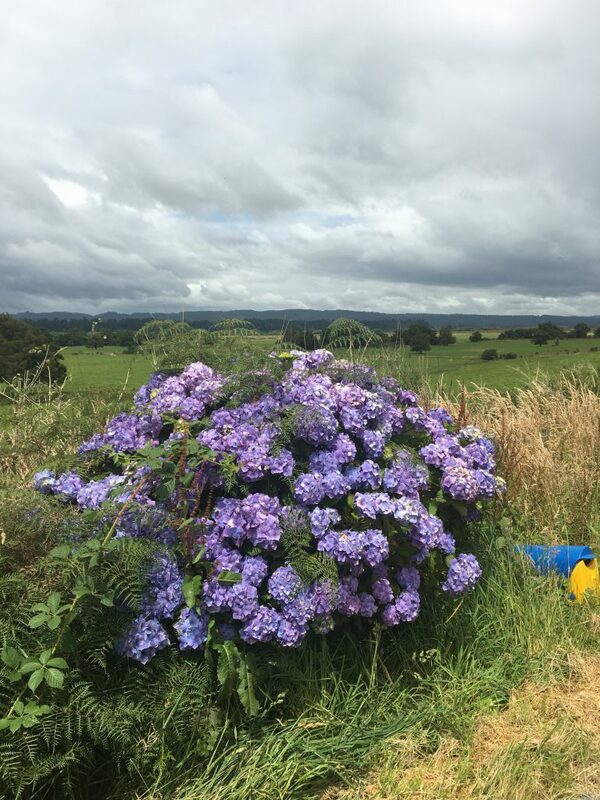 I love the contrast between the green land and this purple bush. 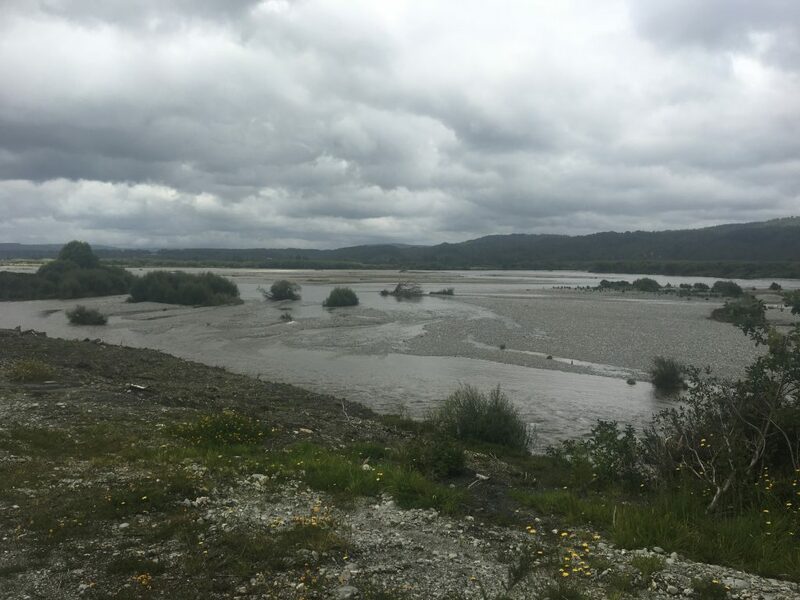 As I approached Greymouth, rivers became larger and more numerous. I wonder what this area would have looked like in the flood that would come the next day. Rain was forecast. I guess this created a negative fire risk. I left the holiday park the morning of 1/18 and cycled about 2 miles back into town to the train station. It was just pouring rain, and the wind was blowing in my face. I think in a much earlier post, I used a reference to Noah’s Arc to describe the sudden rain storm I had in East Texas. I regret wasting that reference on a mere suggestion of a rain storm; a light sprinkling by comparison. On the morning of 1/18, it just dumped on me. I spent about an hour at the train station awaiting the train to Arthurs Pass. When the train arrived, I helped the attendants put my bike in the baggage car, and then went back towards the passenger cars to get on the train. The train started to pull out of the station–with my bike on it! My initial reaction was to run after the train, as though I could actually catch up with it and jump onto it while running. The train left and I was a bit dismayed. The officials present assured me, however, that they were just taking the train to be cleaned and it would be back in about 20 minutes. Whew! Several people had warned me that I should have booked my train tickets weeks in advance, as this is a very popular ride and would likely be full. 2 days prior to the ride, I booked a ticket on line and was surprised when it went through without a hitch. 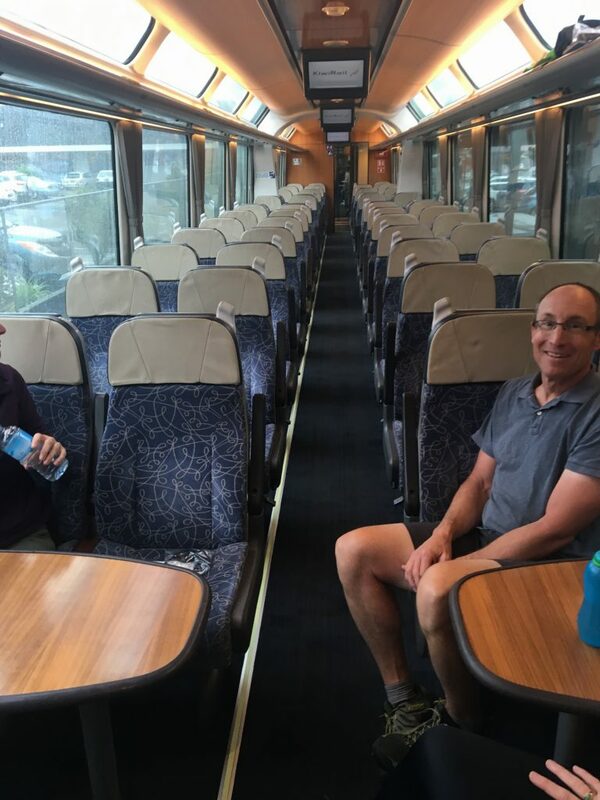 The picture below shows my car on the train to Arthurs Pass; not exactly sold out. There were 5 of us. 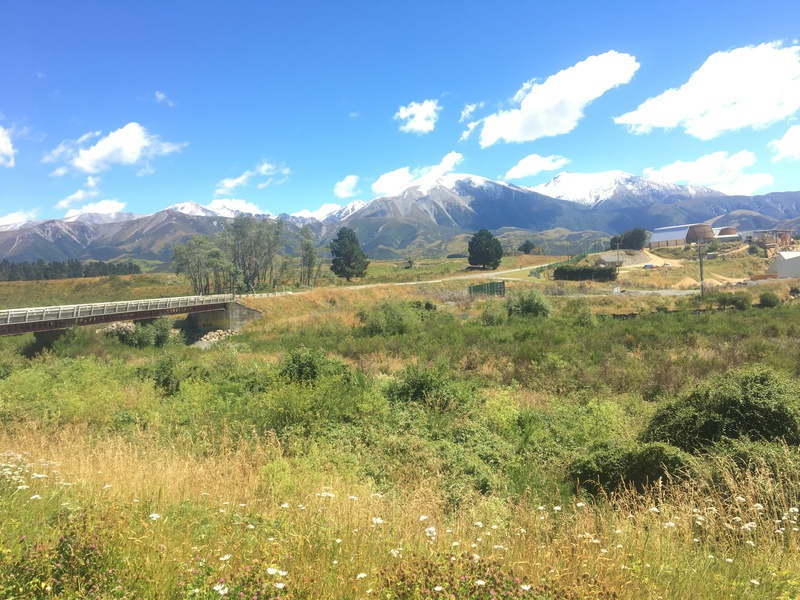 The train ride to Arthurs Pass was beautiful. I tried to take a few pictures, but water on the train window made this difficult. (It turns out that there was an observation car with open sides, but I did not know about it.) Here’s the one good image that I acquired. Along the way, I noticed several roads that were under water–clearly, this was not a typical rain storm! 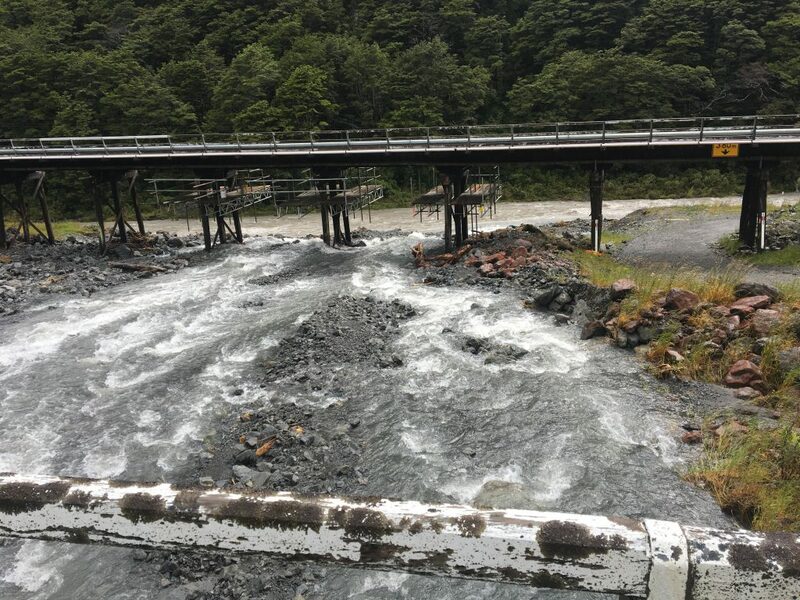 When we arrived at Arthurs Pass, I got soaked just retrieving my bike from the baggage car. 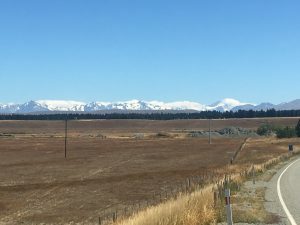 Arthurs Pass is not what I expected; there not any obvious services. I checked the camping app on my phone and found that it was about 10 miles to the closest official camping place. If I had to set up my tent in this rain, everything would get soaked and I was already cold from the soaking I had received that morning and in departing the train. I figured a hotel would be a good idea, and noticed that there was only a single obvious place in the town. I followed the signs to the hotel and found it–prominently displaying a “No Vacancy” sign. Oops. Now, I don’t speak New Zealander very well, but I was pretty certain that “No Vacancy” translated to “Come on in!” And, I was right. Although the rooms were all full, the management offered me a cabin that they had on their own personal property, next to the hotel. The fire place was a nice touch and I got all of my gear dried out. What nice people! They even invited me back to their house for a glass of wine. Nothing like a fire to warm you up, through and through. 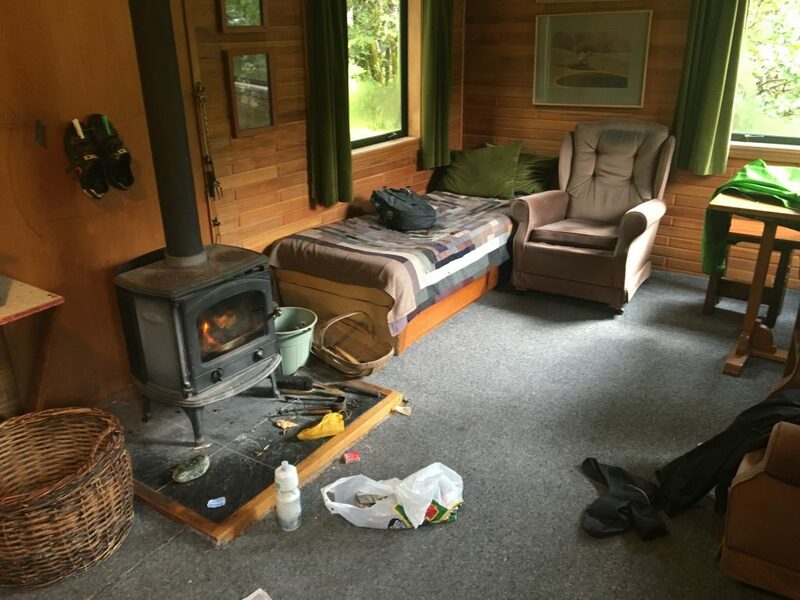 I had the option of spending a full day and a second night in Arthurs Pass. But when I woke up the next morning (1/19), something in me just said, “Get on your bike and ride.” I bid farewell to my kind hosts and got on the road. This proved to be a really good decision. 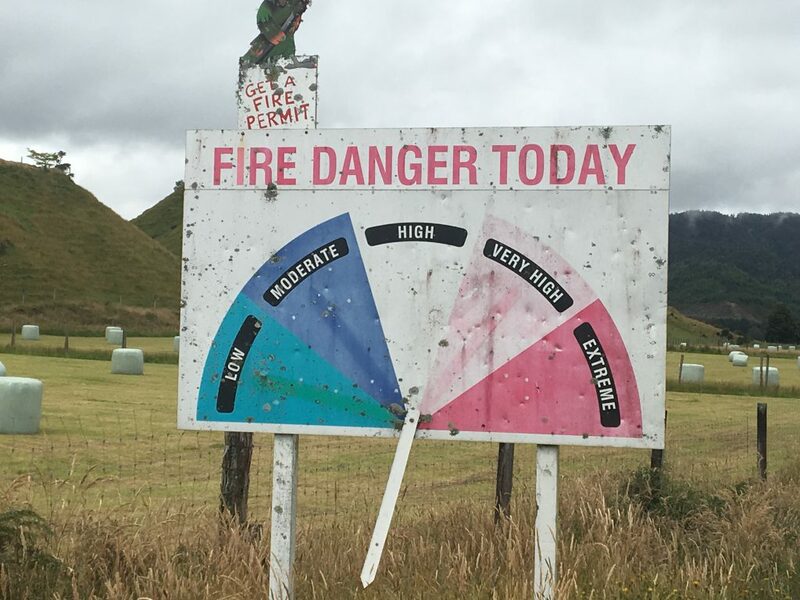 I was heading South out of Arthurs Pass. 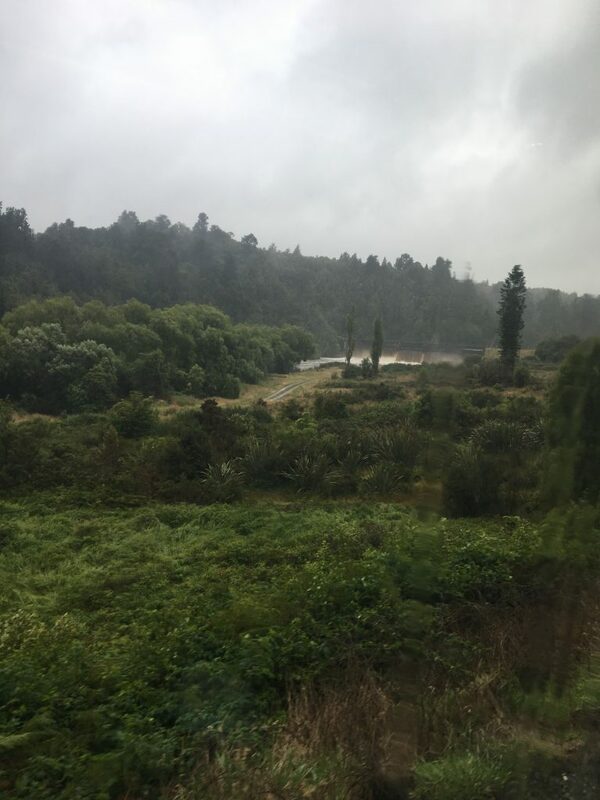 It turns out that a few hours earlier, a huge landslide **North** of Arthurs Pass blocked the highway and the train. This was not a problem for me–I was heading south. But it meant that I was the only traffic on the highway. Yes! It was mostly downhill (at first anyway), and then the rain stopped and the sun came out. And, I got a good tailwind to boot! 20 perfect miles of riding. As I descended from the pass, I could see many areas where the water had washed over the road the night before. Angry runoff from previous day’s flood. You would think that the ride down from a pass would be mostly downhill. But the ride to Christchurch is really 4 different sections. The first was a gradual downhill section for about 20 miles. 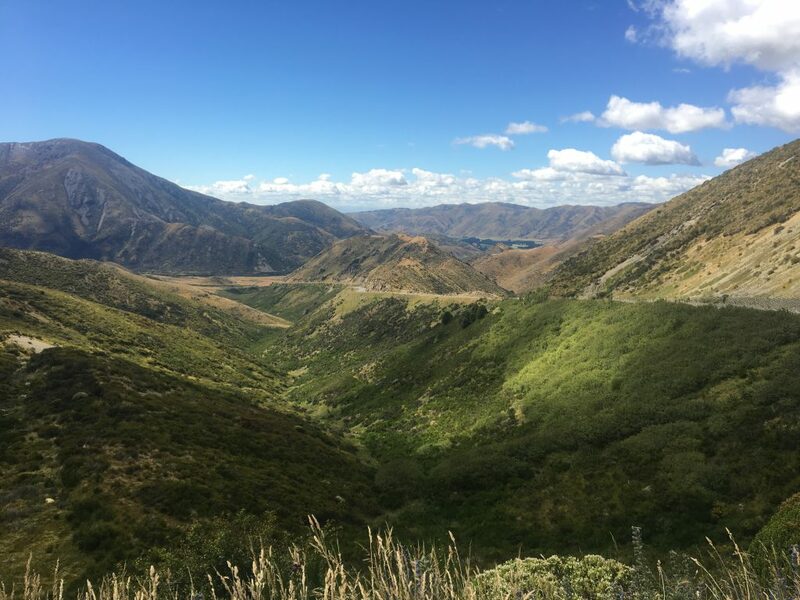 Next, there was another 20 miles of challenging hills, followed by the steepest and scarriest descent I have ever experienced, and then a gradual 40 mile downhill cruise to Christchurch. The hill section was difficult indeed. I had to push my bike for about a mile because it was too steep for me to peddle. After this particular climb, I ran into Michael–a fellow that I had met earlier on the way to Greymouth. He had a tough time getting to Greymouth along the coast, and didn’t stay there–which was why I could not locate him 2 days earlier. He was on his way to explore a local cave with some other people who had a car. The constant climbing was wearning me out, and I was out of snack food and needed a break. 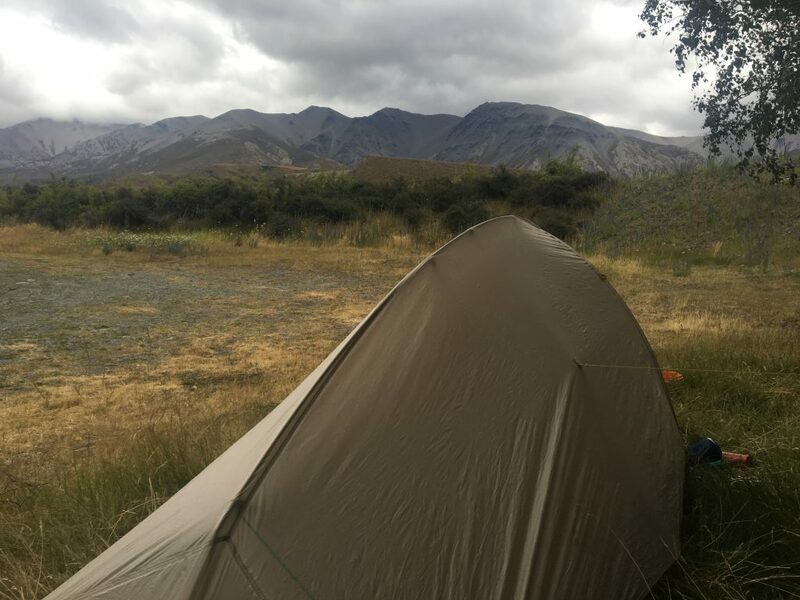 Since I couldn’t make it to Christchurch in 1 day, I had allocated two, and knew that I had to stop and camp somewhere. I found a nice quiet spot near the Porter River and made camp. The water was clean, tasted good (I purified it) and I was mostly out of the wind. Here is a picture I took of my tent near the local mountain peaks. After making a double portion of pasta and soup, I cleaned up the dishes and called it a day. It was getting really cold, so I put on 3 layers of clothing for the night. Even still, this proved to be the coldest night in a tent I have ever experienced. (You may recall that I am using a very light blanket sort of thing rather than a sleeping bag.) It rained, but I stayed quite dry (yea!). As I left my tent the next morning (1/20), I could see that the peaks had much more snow on them than when I went to bed. 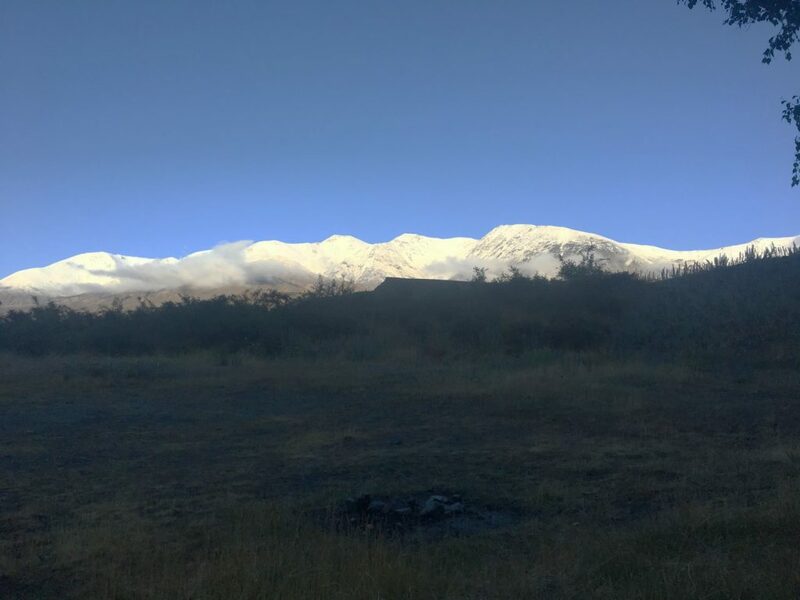 Awaking to snow on the mountain peaks. I also noticed that a small puddle of rain on the tent fly had frozen. I guess I should have kept my “zero bag!” I finished the climbing section and began the rapid descent from the mountains. Somehow the road doesn’t look as steep in a photo. 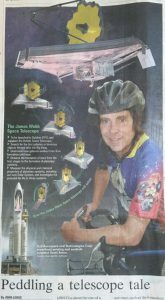 From here on, it was a causual downhill ride into Christchurch. Farmland reappeared, and I said goodby to the New Zealand Alps. The wind changed directions and became a moderate headwind, which basically canceled out the downhill advantage. I arrived (about 7 PM) at the home of John and Adrienne, my hosts in Christchurch for a few days. I’ll tell you a bit more about them in the next post. Tonight, I am giving a lecture at a local pub. My understanding is that more than 50 people should be in attendence. This will be the first pub speaking venue on the tour! The purple bush is a Hydrana, an English garden flower, likely planted by some past pioneer, to reminder her of home. They can be anywhere from white, pink, blue or purple depending on how acidic the soil is. Very glad you are safe and not frost bit. Call home when you are free. Such beauty! I hope your talk at the pub was fun. Stay safe! Love you! Looks like you’re adventure continues through some beautiful territory. Keep on pedaling! 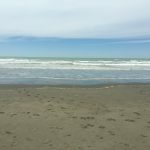 It is so neat to be able to follow your journey through this blog. Thank you for continuing to share. We are happy to see you have made it to New Zealand. Cheers to reaching life existing in the galaxy! I have been thinking of you frequently but not checking your blog until tonight when I tried to catch up mostly by reading your transition blogs. You have covered quite a bit of distance since I last read of your adventures in Wyoming. I’m truly impressed. What a fantastic experience. Kudos to you for following this dream.